Is The PZL M-15 "Belphegor" The Ugliest Production Jet Airplane Of All Time? What do you get when the Soviet Union wants a jet airplane purpose-built to service its massive farms and agricultural collectives? Well, according to Poland, you get the demented looking PZL M-15, nicknamed “Belphegor,” which means a hideous mythical demon who tricks people into thinking they have an invention that will make them rich! Since the late 1940s, the Soviets used the An-2 “Annushka” biplane in the crop dusting role, an aircraft that was about as complex as a tractor, and as slow. Still, the An-2s were incredibly reliable, cheap to produce and forgiving to fly. But by the mid 1960s the USSR was looking at new ways to increase food production and cut food imports, and the An-2 was seen as a handicap to their ambitions. Additionally, having a biplane doing Soviet farms spraying was seen as a relic of the past and was ill suited for servicing some of the massive farms that struggled to support the proletariat’s appetite. As such, a request for new aircraft was made, one that relied specifically on jet power, to become the technological all-star of communist farming. Lala-1 utilized the forward section of the an An-2 while its rear fuselage and tail were completely new. A jet engine out of an L-39 Albatross jet trainer was mounted in its shortened rear fuselage. For almost a year various tests were ran with Lala-1, while at the same time a completely new design was taking shape. This design would become the PZL M-15. The PZL M-15 was totally unique in appearance, with a twin boom tail, a pair of over and under wings connected by struts and huge tanks 377 gallon tanks for chemicals. It had a fixed tricycle landing gear and room for three crew. Up top was the aircraft jet engine, which put out around 3,300 pounds of thrust. The aircraft’s high air inlet helped to keep foreign object and debris (FOD) out of the jet engine during operation, a key design feature for rough-field operations. Regardless of its jet engine, the design had a unique operating envelope, with a stall speed of just 67 mph, a top speed of only 124 mph and a range of just 250 miles. 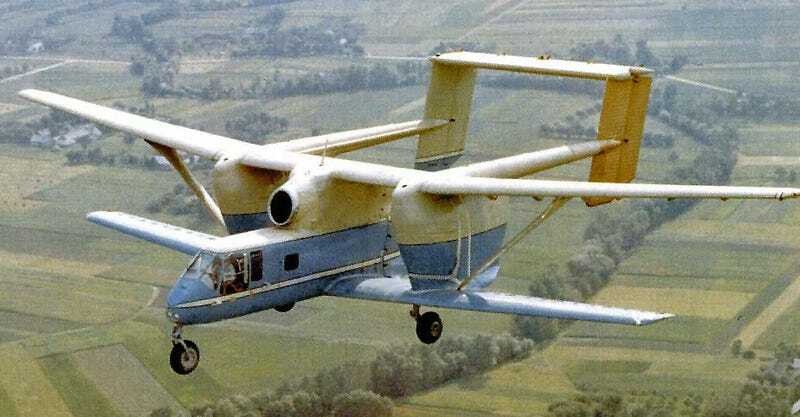 On May 30th, 1973 the first PZL M-15 prototype took to the skies, with another following nine months later. By 1976 the “Belphegor” was put into production with the idea that thousands would be built, just like its An-2 predecessor, but that dream was short lived. Under test conditions the PZL M-15, with its highly trained crews and support personnel, accomplished its mission, but once put into the hands of real farmers, who were accustomed to working on old tractors the An-2’s radial engine and forgiving airframe, the aircraft was downright troublesome and very inefficient. Additionally, it was grossly expensive to build, which was far from ideal for an aircraft that was supposed to replace thousands of An-2s in operation at the time. As for the aircraft’s nickname, the story goes that when it attended the Paris Air Show in 1976 it looked and sounded so strange that the only suitable nickname for it was Belphegor. In the end just 175 M-15s were built, with production ending in 1981. Even though it was not a success, it is thought to hold some records as the world’s slowest production jet aircraft, the world’s only production jet biplane, the world’s only agricultural jet plane, and subjectively the ugliest jet aircraft ever put into production. As for the An-2 it aimed at replacing, it went on to be one of the most successful aircraft ever created with over 18,000 built and it still serves around the globe today.